Clevedon, early yesterday morning. These were the colours of our swim, and they were beautiful. Soft, muted blues, yellows and greys, and the smoky Welsh hills just across the other side, because this is the Bristol Channel, this is the colour that it is, and it’s better to see the beauty in what you have got, than to complain that elsewhere people have blue water to swim in. My swimming companions seemed also to have chosen their colours to match the scene. All except me, who had on a bright red had and a bright orange float. I haven’t put me in: I clashed! 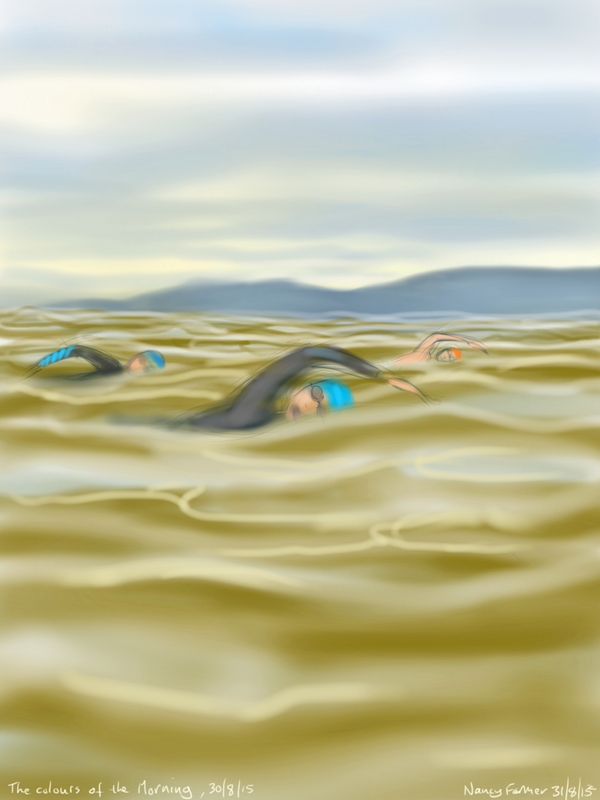 This entry was posted in swimming and tagged art, Bristol Channel, Clevedon, drawing, illustration, open water swimming, sea swimmers, swimming on August 31, 2015 by Nancy Farmer.